Free Webinar: How to Make Paid, Earned, and Owned Media Work for You! 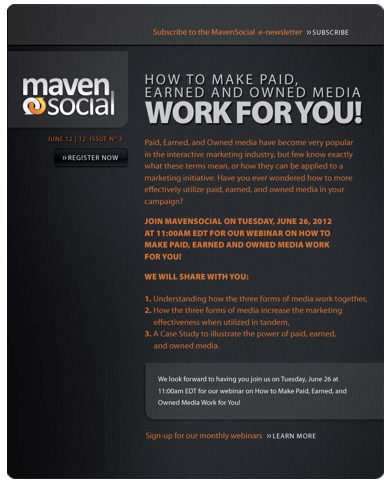 This month MavenSocial is having a webinar on How to Make Paid, Earned, and Owned Media Work for You! benefit you, especially when you understand how they effect your company! Paid, Earned, and Owned media have become very popular in the interactive marketing industry, but few know exactly what these terms mean, or how they can be applied to a marketing initiative. Have you ever wondered how to more effectively utilize paid, earned, and owned media in your campaign? Join MavenSocial on Tuesday, June 26 at 11:00am EDT for our webinar on How to Make Paid, Earned, and Owned Media Work for You! 3. Case Study to illustrate the power of paid, earned, and owned media. We look forward to having you join us on Tuesday, June 26 at 11:00am EDT for our webinar on How to Make Paid, Earned, and Owned Media Work for You! If you would like to learn more about MavenSocial before the webinar, check us out here!